As a mom of four, my house is full of all types of toys: educational, electronic, wooden, and on and on. My favorite kind of toys for my boys are ones that spark their imagination and creativity. Ones that that fosters hours of pretend play with each other. It is easy to get wrapped up in battery operated or electronic toys with all of their cool bells and whistles. And I have nothing against those kinds of toys, we have those too. But I do think it is important to balance it out with "unplugged" toys. Pure Play Kids is a Connecticut based, online toy store that offers a large selection of creative playthings including wooden toys and cloth dolls. The majority of their toys are made here in the United States while the rest are made in Europe. "Kid-powered is the term we use to describe our products. Let kids provide the motion, sounds, storyline and characters that drive the toys – not vice-versa – and witness a flourishing of imagination, confidence and skills. Always remember as your shop for toys here and elsewhere: a great toy should be 90% kid and 10% toy." When I learned that Pure Play Kids was founded by Tania & Mike Grant living right here in Connecticut, I was thrilled. I often feel alone in my green quest here in the Nutmeg State so seeing other CT parents who feel the same as me was exciting. In addition to selling fun creative toys made by other manufacturers, they also have a line of their own original toys. 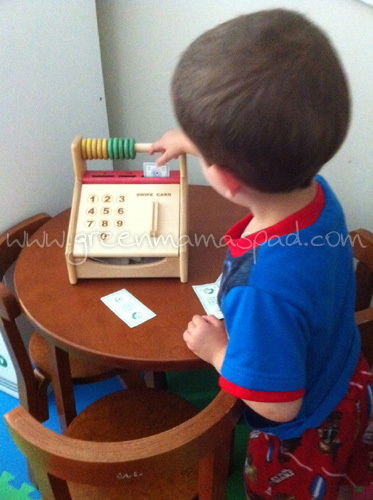 Pure Play Kids sent me the Wooden Cash Register from their original line for my boys to play with and try out. 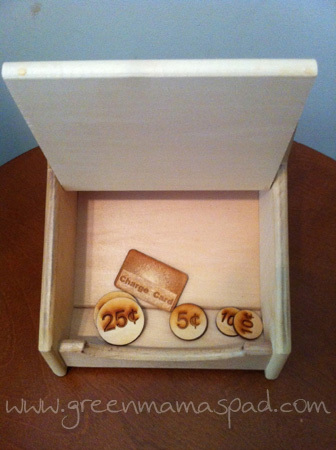 This Wooden Cash Register is made completely of wood and comes with 6 wooden coins and a wooden charge card in a fabric pouch. There are slots on the top to place each coin in and your child can practice matching the numbers and sizes of the coins to the correct slot. 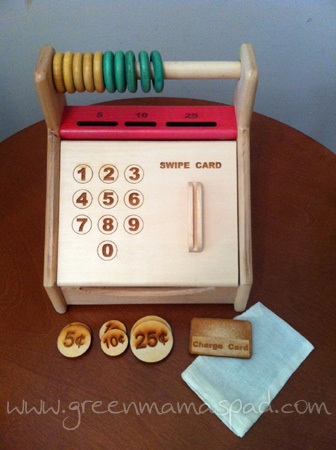 There is an abacus on top for them to use for counting and a charge card swiper. The cash register also opens up so you can store all of your money inside. 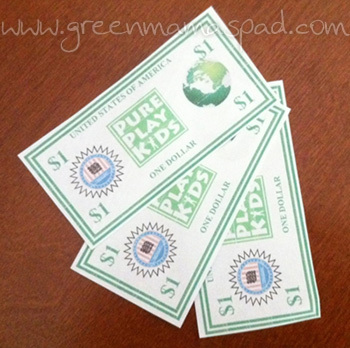 If you want to add some more fun with paper money, Pure Play Kids offers a free download from the Pure Play Kids blog with $1, $5, $10 and $20 bills. This is such a great way to introduce the concept of money to your children. 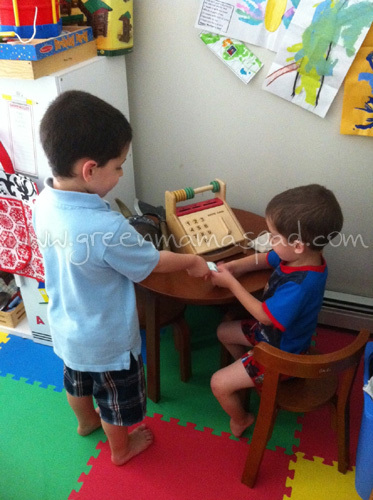 When the cash register first arrived in our home my boys literally fought over who got to play with it. So we initially had to set up intervals and taking turns that first night. The next day we brought it into the playroom and set it up on a table so they could play store with it. Watching and listening to them play with this was a lot of fun for me. At one point, the 6 year old walked up to one of the 4 year olds and said "I want to buy this Thor mask because it is my kids favorite." So funny! They went back and forth taking turns of who was shopping and who was the clerk. I even broke out some reusable shopping bags after a while so they had something to tote their purchases around it. After nearly a month of playing with it I can say that my boys love this cash register and are still playing with it a lot. For me I am really happy with the sturdy quality and I love how creative they can get with it. I know we will enjoy many years of fun with it! Pure Play Kids offers $5.95 flat rate shipping within the continental USA. With holiday shopping just round the corner, this is a site you want to add to your list! Visit Pure Play Kids and tell me which product you like the best. - "Like" Pure Play Kids on Facebook and tell them I sent you! Please leave me your first name and last name initial to validate. - "Like" Green Mama's Pad on Facebook. Please leave me your first name and last name initial to validate. - Share this giveaway with link on Facebook. You can do this once, total. Leave link in comment. - Follow Green Mama's Pad publicly on Google Friend Connect. - Subscribe to my RSS feed in a reader or subscribe via e-mail. Your email must validate or it will not count. - Worth 20 entries! You may not use this entry method if you already used it on another one of my giveaways. Sign up and verify your free account at Zumbox through my referral link (https://www.zumbox.com/giveaway/23922wf). 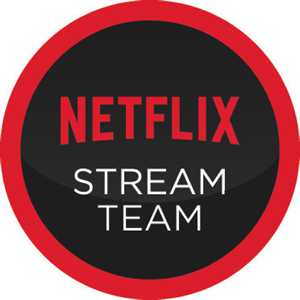 Once you sign up they will snail mail you a verification code within a few days that you must enter into the website to verify. Once you do that, you will then be given your own referral link. Come back here and leave me your referral link in 20 comments to get all of your entries. This giveaway is open to legal US residents 18+ only and will end on Tuesday, August 2 at 11:59pm EST. One winner will be chosen at random using Random.org and will be posted on the Winner's Announcement Page. Winner has 48 hours to claim his/her prize otherwise a new winner will be picked. Please leave your e-mail address in all of your comment(s) so I can contact you. I will not share your e-mail address with anyone, it will strictly be used to notify you if you win. Good luck! I love the natural soap-making kit and the make your own chalk kit! Those look like fun projects to do with my daughter. I love the Three-Piece Kids Rake and Shovel Garden/Beach Set! Much better to get a useful tool then a plastic toy one! I would get the Cyclops towel. Too Cute! Erin T. likes you on FB! I like the Doctor Dress up kit. My kids would love the Fairy Stage plus 5 Finger Puppets. I would get the Earth Friends doll Lilah. I Like Pure Play Kids on facebook! I Like Green Mama's Pad on facebook! I am a follower Google Friend Connect! I am a subscriber via e-mail! My daughter would love the Earth Friends Jayden doll. I 'like' Green Mama's Pad on Facebook. I like the building planks! I Follow Green Mama's Pad publicly on Google Friend Connect. I love the Wooden Fire Truck Toy!! I love the Salad Booster Set! I follow Green Mama's Pad publicly on Google Friend Connect! I follow @GreenMamasPad and @PurePlayKids on Twitter and tweeted! I like the 41 piece block junior set. I really like the Building Planks kit. I like the Little Hands Music Pack! I'd love to get my little girl the classic wooden rocking horse. It looks like a quality piece that all of our future children could use too. LOVE the Wooden Fishing Rod Toy w/ 5 Fish ... How Cute! I would love to get my daughter the Marine Life Coloring Table & Chairs. I like Pure Play Kids on Facebook user Lisa G. and let them know you sent me. I like you on Facebook user Lisa G.
The Seahorse Rattle is super cute! I like the Travel Stacking Dollhouse & Puzzle. My son is obsessed with firemen so I'd have to say the firetruck! I love the four floor doll house. The 4 Floor Wooden Doll house looks fun for my daughter. Natural Lip Balm Kit would be fun !! I like the 78 Block Advanced Block Set. I like the Rusty Cyclops Towel. I like Pure Play Kids on FB (Sarah SMile). I like the Natural Soap Making Kit that sells for $17.95! Love & Diamonds Are In the Air! Shop Target's Back in Black Friday Sale! Zumbox Digital Postal Mail - Go Paperless & Win!